At the 2014 Mazda 6's U.S. launch in November 2012, the company made us all giddy by announcing they would sell a 6 diesel in America. It was supposed to arrive shortly after gas 6 in summer 2013. Then it was pushed to spring of this year. Now Mazda is pushing the 6 diesel further down the road. In a statement released today, Mazda says it's delaying the diesel's launch further because it wants to meet emissions requirements without using a urea injection system and without overly sacrificing performance and economy. It's an interesting move, given that pretty much all U.S.-bound diesels are getting urea stuff to combat pollutants. Mazda released no timetable for the 6 diesel, other than that more information about the fuel economy and on-sale date would be released closer to its launch. 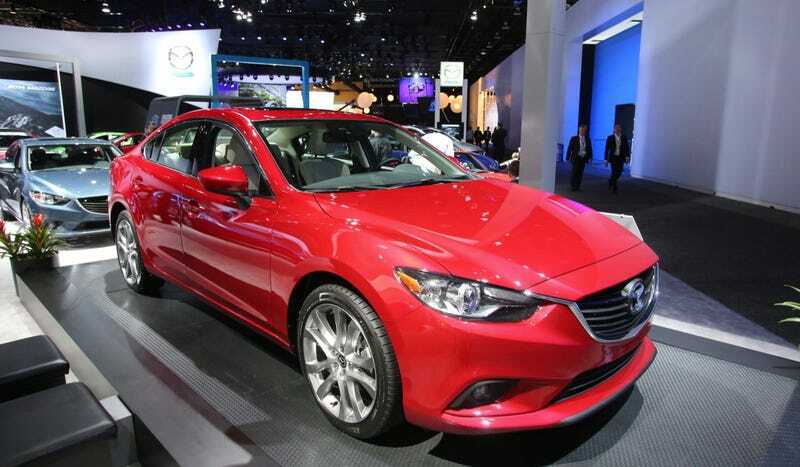 In 2012, Mazda said the engine would churn out 310 lb.-ft. of torque with either a six-speed manual or automatic. If you've been holding out for a more economical 6, the i-ELOOP gas version already does 40 mpg on the highway. But if you really want a torquier 6, you're going to have to wait even longer. At least VW can breathe easier knowing the Passat TDI can go longer without competition.